We know that it is God who supports the ministry of Word of Life through the gifts of His people. So to honor Him and to build trust among our friends, volunteers, employees, and donors our goal is to provide as much accountability as is possible. Transparency, honesty, and openness aren’t just buzz-words, but convictions we take seriously. Every year we take time to review the numbers from the previous year. We then use these financial numbers combined with our ministry impact and influence to create the President’s Report. 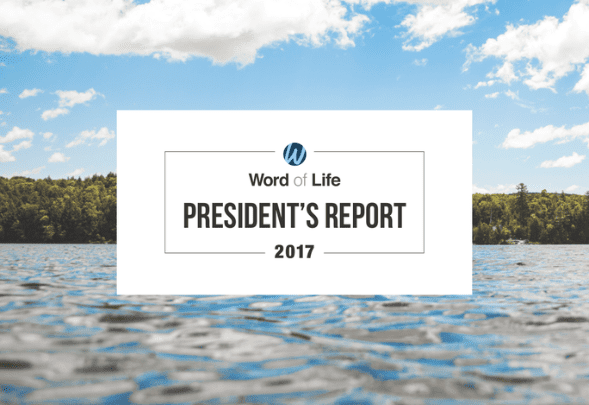 It’s created by the Executive Director as a sort of a “State of the Ministry” report to encourage donors, friends, and employees. Want to know how we prioritize our finances or how we use the donations we recieve for ministry? Read the follwoing documents. Founded in 2001, Charity Navigator has become the nation’s largest and most-utilized evaluator of charities. In their quest to help donors, a team of professional analysts has examined tens of thousands of non-profit financial documents. They have used this knowledge to develop an unbiased, objective, numbers-based rating system to assess over 8,000 of America’s best-known and some lesser known, but worthy, charities. Specifically, Charity Navigator’s rating system examines two broad areas of a charity’s performance; their Financial Health and their Accountability & Transparency. Their ratings show givers how efficiently they believe a charity will use their support today, how well it has sustained its programs and services over time and their level of commitment to good governance, best practices, and openness with information. They provide these ratings so that charitable givers/ social investors can make intelligent giving decisions, and so that the nonprofit sector can improve its performance.